WHITTLESEA, Australia (CNN) -- Winds whipping across southeastern Australia's countryside continued to fan deadly brushfires Wednesday, spreading flames through rural towns and ravaging scores of homes. 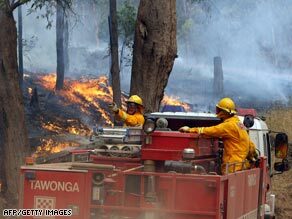 Firefighters try to stop a Kiewa Valley fire from reaching the town of Dederang in the Victoria Alps on Tuesday. "The temperatures are much cooler, but the concern is there's still this wind which sort of fans the flames and keeps them spreading," said CNN Correspondent John Vause from Whittlesea, where tent cities have sprung up just north of Melbourne. Relief agencies pitched camps for those forced out of their homes. At least 181 people have died from the brushfires. Weekend fires ravaged the towns of Marysville and Kinglake, officials said. More than 20 fires were burning Wednesday. "We think there will be more deaths," Police Chief Christine Nixon said. "It's a major issue ... that we're finding more bodies as we gain access to locations." Charitable contributions continued to pour into the Salvation Army as Australians were touched by the crisis. "We're in the midst of this huge financial crisis and people want to give," Major Rodney Barnard said. "The Salvation Army has been running an appeal and we've raised in excess of AU$2 million (US$1.3 million)." "The seventh of February will become etched in our national memory as a day of disaster, of death and of mourning," Rudd said, as he announced that offers of assistance had poured in from around the world, including from France, Japan, New Zealand, Singapore, Thailand and the United States. "All Victorians and all Australians should know that in this darkest hour, they are not alone," he said. German Chancellor Angela Merkel and French President Nicolas Sarkozy wrote letters to Rudd expressing their condolences. "I would like to express my deep, profound sympathy to you, the families and loved ones of the victims, and the Australian people," Merkel wrote. "To the wounded I wish a quick and full recovery." Sarkozy also offered his support and suggested that the French island territory of New Caledonia in the Pacific could be used as a staging ground for supplies to Australia.